This week's tablehopper: from taco to Tahoe. 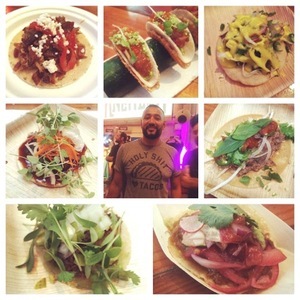 7 of the 16 tacos at EDSF’s Taco Knockdown last night. And one very cute taco shirt (and man wearing it). Photo: © tablehopper.com. Hola, amigos. Last night’s Taco Knockdown—the opening event for this weekend’s Eat Drink SF—definitely fulfilled my taco quotient for the week. As a judge, I had to taste 16 tacos, but we’re talking about tacos made by badass San Francisco chefs, so all of us had to remember to taste and not finish them. Congrats to Trick Dog for winning judges’ choice for their outstanding birria de chivo, and Dosa won people’s choice for their duck vindaloo taco in roti, inspired by a Frankie (an awesome street food wrap you can find in Mumbai). I was sad to come home last night and realize I was out of Brioschi, Italy’s amazing version of Alka-Selzter (the Italians know a thing or two about indigestion). Inhale, exhale. And tonight begins wave two of Eat Drink SF’s festivities, the grand tastings. There are still tickets for Friday’s and Saturday’s grand tastings (although the cocktail class I am co-hosting on Saturday afternoon is sold out, sorry everyone! )—don’t forget to use code TABLEHOPPER for a special discount. There’s also an Aperol spritz brunch party at Foreign Cinema on Sunday that is going to feature many Italian-inspired dishes. Today’s issue is the last one you’ll see from me until September 1st. Since I got rained out of my Tahoe vacation six weeks ago, I’m going back up to try for round two this Sunday. Looking forward to a week of grilling and chilling. And crappy cell service. And catching up on my writing, and reading. And avoiding email. And hopefully enjoying plenty of sun. Because Fogust is not my jam, even after living here for 21 years. Safe travels to all the Burners heading up for TTITD (That Thing in the Desert). I’m missing being out there. Although Burning Man with bugs sounds so strange. Mosquitos? Crazy. But every year, it’s always something out there. Many things.